Green Acre Sod Farm can help you build the highest quality outdoor fireplace or fire pit to provide a spectacular focal point for your outdoor living space. Your family and friends will enjoy gatherings in this warm and inviting entertainment area year round. 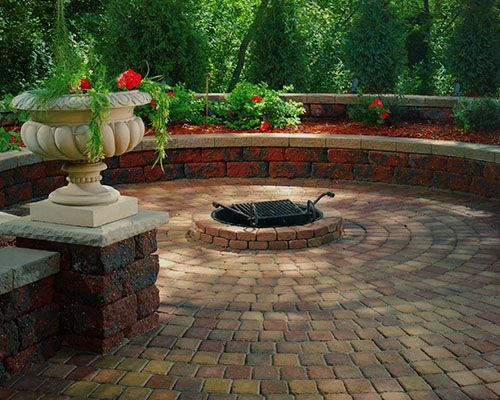 Contact us to begin your unique outdoor fireplace or fire pit to complete your backyard retreat. 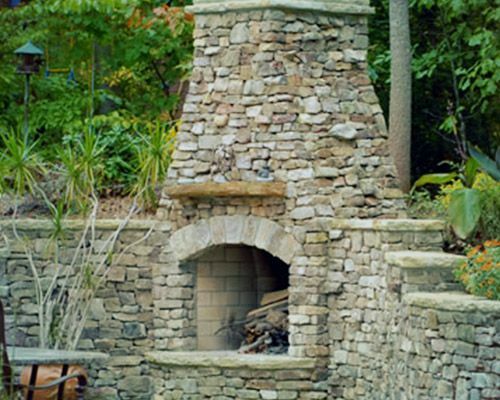 Green Acre Sod Farm specializes in the design and installation of natural stone fireplaces and outdoor living products. Natural stone adds style and natural beauty to any Tulsa outdoor living area or landscaping project, and makes your fireplace look natural, yet upscale. Stone fireplace designs are based on your personal preferences as well as the design of your outdoor space and can be stacked or laid flat to create the unique design that will set your outdoor living area apart from any other. Green Acre Sod Farm only uses premium natural stone to help you achieve the perfect finish for your outdoor fireplace. Stone fireplace design is unique because the natural stone lends itself so well to rustic as well as modern designs. For example, rustic stone fireplace designs may include a slate fireplace with wrought iron chairs and table while a limestone fireplace with evenly sized and evenly spaced stones can look very modern on a patio with a large glass table and metal chairs. As a top building material, paving stones have grown to become one of the favorite materials of many designers, landscapers, and homebuilders—including home owners as well. Paving stones will never fade in color or appearance because the material makes use of imported oxides for coloring which is responsible for reducing fading and allowing the surface to retain its brand new look over many, many years. Concrete products have been known to show signs of fading in just a couple of months especially when exposed to harsh environments. Among the various range of architectural products in the market, paving stones are included in the list of products that are manufactured based on the American Society for Testing and Materials standard. This is why after testing it, more information about paving stones reveals that it is approximately four times stronger than concrete and about 10 to 12 times better than asphalt when it comes to material strength. In the event that your outdoor fireplace or pit needs repair work or cleaning, you only have to remove a stone or two per depending on the size of the paving stone. This means that only the stones needed to gain access will be removed and then replaced immediately in a flawless fashion without changing the look or design of the fireplace or pit. This is different with some paving methods, such as natural stone. If repair work is needed on a natural stone fireplace, a greater challenge exists to reassemble the unit to its original design once the cleaning or repair work is done.